SP’s Naval Forces (SP’s): Beginning from the times of designing the first Leander class frigate, the Indian Navy’s Design Organisation has clocked several stupendous successes in not just rolling out state-of-the-art surface ships designs but also ensuring their top class construction indigenously. What was the strategy that led to successful construction of the home-grown ship designs? 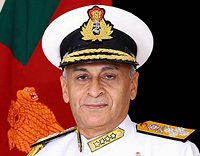 Director General Naval Design (SSG) (DGND-SSG): Warship design and construction are one of the most complex engineering activities involving aggregation and integration of multitude of components and systems. Unlike other industries like automobile or aircraft industry where a prototype can first be developed, optimised and then replicated in large numbers, warship building involves smaller numbers, concurrent evolution of design, and management of many uncertainties that emerge during construction period. Despite these complexities, it was the wisdom, vision, confidence of the Indian Navy (IN), backed fully by the Government of India and the defence public sector shipyards that enabled the realisation of self-reliance in ship design and construction. Decision to go ahead with indigenous ship design and construction was a bold act of faith on the part of IN. It reflected the confidence the IN had in its designers and the growing capability of Indian shipyards. The Indian Navy made a modest beginning in 1962 in the field of indigenous warship design and construction with the establishment of a design cell in the Directorate of Naval Construction (DNC) which later grew to become DNC’s Central Design Organisation in 1965. Since then, the IN design agency has steadily grown to produce over 19 designs to which over 85 ships have been built. The Directorate of Naval Design (DND) has thus evolved into a cradle of excellence in warship design over the last five decades. IN also celebrated golden jubilee last year to commemorate 50 glorious years of indigenous warship design. Presently, IN is first among the services in indigenisation and takes great pride that as on date 100 per cent of its ships are being sourced indigenously. Indian Navy’s focus at all levels for progressive indigenisation with sourcing of weapons and sensors and other critical equipment through joint development and licensed production has borne good results. From totally relying on foreign weapon and sensors fit, considerable enhancement in indigenous content is seen in the latest Kolkata class destroyers and Kamorta class corvettes. 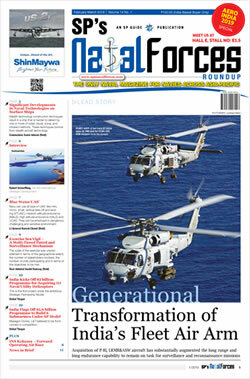 DND has been playing the central role in configuring its designs to integrate advanced weapons and sensors suites, incorporate advanced stealth features, and improved propulsion technology from steam to diesel to gas turbines. New concepts for enhanced operator convenience through automated control and monitoring systems such as Integrated Platform Management System, Integrated Bridge System, Advanced Composite Communication Suite, Combat Management System and Total Atmosphere Control System have been incorporated in the ships to bring about a technological transformation in the equipment and system fit of indigenous warship designs. Stealth has been a focus area of design with significant improvements made in Shivalik class designs with attention to reduction of radar cross section, infrared signature and acoustic signatures. In future these designs would be further improved upon. One of the most important strategies in build-up of the indigenous warship design is the human resource strength of DND (SSG). The DND has derived its strength from the institutionalised and systemic capabilities built up over the years. These capabilities have been sharpened by way of the rich and diverse experience of its officers and drawing office staff in execution of large number of projects. The main challenge however is in skill-sets retention, besides time and effort required in building of the capabilities with new personnel joining the organisation. The shipyard infrastructure at the defence shipyards has improved over the years. The crane capacities have increased from 50 tonnes to almost 300 tonnes in some yards, and the infrastructure has been augmented with construction of new slipways and dry docks. Continuous improvement in design procedures, tools and technology over the years has enabled the Indian Navy ships to keep up with the rapid advancements in naval ship technology witnessed over the last two decades. Use of 3D CAD modelling, finite element structural analysis, computational fluid dynamics, wind tunnel testing, EMI/EMC testing, stealth signature prediction software, etc, have led to progressive refinements in design besides leading to improved visual appreciation. The directorate is also setting up a virtual reality lab to enable operator inputs at early stage in design. DND has come a long way in its endeavour of design and building state-of-the-art surface warships since the Leander class frigates. Not just in terms of sheer number of ships designed indigenously by the directorate, the ship designs have also been significantly upgraded in their capabilities, features with incorporation of niche technologies. Considering the impressive lineage, the nation had reposed its trust on DND (SSG) and tasked it to design one of India’s most ambitious and challenging warships ever, the indigenous aircraft carrier. SP’s: Until the recent times all of indigenous warships construction was through the system of nomination of the public sector defence shipyards. From the Design Bureau’s perspective how would you like to analyse the experiences of indigenous shipbuilding by the defence shipyards over the past 50 years? DGND-SSG: Till about middle of last decade, defence shipbuilding was mainly confined to four defence public sector shipyards. Orders on the defence shipyards were generally placed on nomination basis considering complexity and uncertainties of complex warship building projects. Concept/basic design for the ships were largely provided by the Indian Navy and the shipyards were required to undertake only detailed design/production drawings. Indian Navy’s experience with the defence shipyards has been very good as reflected in realisation of large number of indigenous warships. Although, the defence shipyards over the years have built up capability to build warships, however, with increase in naval shipbuilding orders over the years, there is a requirement of pooling of resources and sharing of load with private shipyards. The shipyard infrastructure at the defence shipyards has improved over the years. The crane capacities have increased from 50 tonnes to almost 300 tonnes in some yards, and the infrastructure has been augmented with construction of new slipways and dry docks. The construction of modular workshops to allow all weather work, with access available for lifting fully outfitted blocks to the slipways are major and critical infrastructure upgrades. Creation of additional wet basin with critical berthing facilities are also expected to ease the past infrastructure constraints. Some of the defence shipyards have also added ship-lift facilities with dry berths to facilitate building of ships. Reduction in build periods of warships has been a challenge. To achieve this, besides augmentation of the yard infrastructure, the shipbuilding processes in vogue are also being transformed. The areas that require transformation in this regard include design tools/database, organisation, planning/production control, supply chain management, process engineering, human resource management, work culture, vendor development, etc. One of the means to bring about the process engineering change is to implement integrated construction (IC) methodology at our shipyards. This methodology, aims at achieving higher extent of pre-outfitting at block stage, rather than at the post-launch stage, thereby affording significant savings on timelines and man-hour costs. The advancement of outfitting to earlier stages can result in these savings because of improved access for personnel/material handling equipment, improved working conditions, avoiding of bunching of work. The implementation of these practices would also require early selection of equipment, change in procurement practices, and reorganisation of the yards. Indigenous ship construction is set to take a big step with Project 17A ships being constructed using IC methodology to reduce build periods. Modular construction refers to construction of blocks at several locations with assembly in one yard. It can facilitate partnership between capacity constrained shipyards to collaborate and optimally utilise capacity available in other shipyards. The partnership for modular construction could be between ‘public-public’ shipyards or ‘public–private’ shipyards in the country, to derive mutual benefits. Modular construction would require design of structure of the modular blocks for sea or road transportation, development of common build and accuracy standards, and total quality assessment/control. Infrastructure augmentation such as availability of sea-going barges with restraining arrangements, goliath cranes with access to sea for lifting blocks, and land transporters for movement to slipway or close to building block would also be required. Careful planning holds the key to shorten build periods. Build strategy is critical for success of shipbuilding projects, and must also assess the risk which can lead to time and cost overruns, with suitable risk mitigation methods. Production commencement is to be planned with adequate gap after contract to enable ordering of equipment and maturity of the detailed design. New techniques such as Earned Value Management based assessment of physical progress, recasting of S-curves based on trade wise assessment of manpower availability, especially for outfitting to suit IC also need to be implemented. Capacity assessment and strategy to manage excess loading through outsourcing or other means need to be figured out in advance so that no time is lost during project execution. Notwithstanding scope for improvement as outlined above, it is a fact that indigenous naval ship design and construction capabilities are a remarkable success story in which defence shipyards have played significant role, therefore capabilities created at defence shipyards need to be nurtured as a ‘national resource’. SP’s: For the past decade or more the focus has gradually shifted to engaging the private sector also in key infrastructure development for warship building, as also in establishing high-end technology centres of excellence in pursuit of generational upgrade for the warship construction within the country. What is your perspective on the emerging trends? DGND-SSG: A typical warship comprises of ‘Float’, ‘Move’ and ‘Fight’ components. The indigenisation content in ‘Float’ is more than 90 per cent, in ‘Move’ is over 50 per cent and in ‘Fight’ is over 30 per cent. With most of the warships and submarines currently being built by way of ‘Make in India’, the next enhancement in indigenisation levels being focused is on naval equipment. The ‘Move’ component which includes propulsion and auxiliary machinery is currently largely assembled/licence produced in India. The ‘Fight’ component which includes weapons and sensors are largely imported, view niche technologies and low volumes involved. The ‘Move’ and ‘Fight’ equipment fit of warships are therefore the focus areas for ‘Make in India’ in future. Modular weapons and sensors with standard physical system and electronic interface are key to the reduction of build periods. Modular equipment are required to be developed to enable easy pre-outfit on new construction ships and facilitate easy installation and connectorisation of upgrades during the service life of ship. Modular engineering equipment are also being manufactured as seen in recent trends in packaging of AC plants, air handling units, hydraulic starting units for gas turbines, etc. With focus on ‘Make in India,’ there is a need to factor requirement for modularity during the initial stages of the development of such indigenous equipment. Many advanced navies are using the concept of integrated mast, wherein the whole mast is fabricated, outfitted and tested on land-based test site, effectively delinking the progress of engineering work and readiness of weapons and sensors onboard. This concept can lead to significant reduction in build periods and also enable improved performance of sensors, with greater degree of completion of ship at delivery with respect to its battle worthiness. Many advanced navies are designing their ships with integrated electric propulsion to meet both propulsion and power generation requirements. Electric propulsion also affords enhanced flexibility in operation, low acoustic signatures, lower maintenance cost (due to optimum loading of prime movers) and enhanced flexibility in location of the diesel alternators, etc. There may be a need to develop one of the private/public shipyards to manufacture the system components in collaboration with a suitable foreign firm experienced in diesel-electric propulsion. To incentivise the shipyard from a ‘Make in India’ perspective, the shipyard could be designated as single source for entire system supply and integration on board for a period of 10 years (for the developed capacity of the power plant). 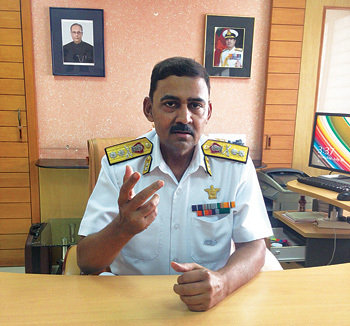 SP’s: In the recent years, the Indian Government has made a departure from the established norms of nomination of only defence shipyards for indigenous construction of the surface ship as per designs of the Director General of Naval Design (Surface Ship Group). How do you view this development in the context of Indian Navy’s aspirations for force level accretion to augment maritime capabilities within the desired timelines? DGND-SSG: At the outset, I would like to clarify that all major combatants presently being designed by the DND are being built exclusively in DPSU/PSU shipyards. Ships being built by private shipyards are being designed either by shipyards themselves or through their respective design collaborators. However, with limited shipbuilding capacity available at DPSU/PSU shipyards and considerable spare capacity with private shipyards, the Ministry of Defence (MoD) has started looking at private shipyards for naval shipbuilding projects on competitive basis. While our experience with private shipyards regarding delivery of yard crafts has been good, they need to enhance capability to produce larger and weapon intensive naval ships. It is anticipated that the active participation of private shipyards in naval shipbuilding would bring in the spirit of healthy competition and more importantly faster pace of ship acquisition to meet the Indian Navy requirements. SP’s: From the designers’ perspective how would you like to evaluate the available infrastructure, technology absorption capability, shipbuilding and ancillary skill-sets available with the leading shipyards in the private sector? DGND-SSG: With the increase in global trade and spurt in demand for commercial ships about a decade ago, several new shipyards had developed in India to capitalise on the shipping boom. The boom resulted in creation of green field shipyards with very good infrastructure in private sector shipyards. Most of the orders to these shipyards in their initial phase were for commercial ships. The owner provided the design and sometimes even the material to the shipyards, leaving the yards to focus exclusively on construction and delivery. Therefore, in-house design and R&D capabilities were not focused upon by most of the private shipyards. With the global recession setting in 2009 and resultant downturn in shipping industry, several commercial shipbuilding orders were cancelled resulting in substantial spare capacity in Indian private shipyards. This had led to associated financial problems in the shipyards as most of the shipyards had invested heavily towards creation or upgradation of their infrastructure. As against the above-stated backdrop in commercial shipbuilding, the naval and Coast Guard orders for ships have shown an increasing trend. The experience of the ship acquisitions so far has indicated that though private sector shipyards often have spare infrastructure capacity as compared to DPSU shipyards but lack capability to build complex warships because of their lack of experience in naval shipbuilding. DPSU shipyards have been therefore encouraged to partner with other DPSU yards and private yards with spare capacities to overcome their capacity constraints. The transition wherein capacity and capability is available in all yards may become a reality in due course, as many naval auxiliary craft orders have been bagged by private shipyards. The large capital investments made by the shipyards put enormous strain on their finances, with consequent pressure on availability of working capital. With a sufficient order book (naval and commercial ships) the financial challenges can be managed as shipbuilding is essentially a game of volumes. There is a need to focus on “much more productivity and competitiveness of Indian shipyards, with much less capital investments on shipbuilding infrastructure”. It is imperative that the current period of low order books for some private shipyards could be utilised to maximise productivity through low capital intensive but extremely effective transformation of work practices to maximise returns on earlier investments. The strengthening of design offices at private shipyards requires periodic upgradation of human resources, design tools and focus on synergising the 3D CAD models to develop production-friendly designs for enhanced productivity. The capabilities of young designers need to be enhanced with special focus in curriculum on system integration skills (with strength to analyse impact of their system design on other systems). 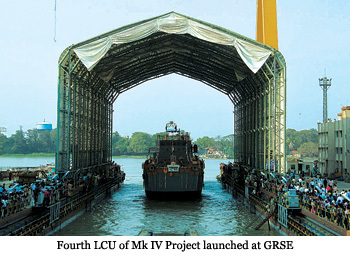 With major shipbuilding yards in the country both public and private improving their capacity and capability progressively, Indian shipbuilding in general and naval shipbuilding in particular will gradually develop to not only meet aspirations of the Indian Navy, but also make the Indian shipbuilding industry a strong global player. SP’s: In the overall context of recent pronouncements on ‘Make in India’ campaign how would you like to evaluate the role and involvement of the private sector shipyards in these ventures? DGND-SSG: Shipbuilding and its growth in India are vital for Indian economy and national security objectives, because of the consistent growth in sea trade and need to safeguard strategic sea lanes. Being a key manufacturing sector, growth of indigenous ship and submarine building capabilities and capacities is not only critical from national security perspectives, but also important to promote the ‘Make in India’ initiative of the Government of India to achieve self-reliance in manufacture of defence equipment within the country. The complex nature and long construction periods involved in acquisition of naval platforms require detailed planning with requisite funding support spread over a number of years. Warships are inducted and de-inducted in the IN as per institutionalised plans such as Long Term Integrated Perspective Plan and Maritime Capability Perspective Plan. Additionally, in order to encourage the Indian industry to develop niche technologies within the country, a ‘Technology Road Map’ was also drawn up and a forecast requirement for naval equipment for next 15 years has also been outlined. A number of private sector shipyards in India have invested in world-class shipbuilding infrastructure and are fast gaining prominence in the field of shipbuilding. These shipyards have equipment of latest generation, and some are equally modern and capable than the ones available in DPSU shipyards. In order to reduce build period of ships, it is imperative that the participation of private and public shipyards be encouraged to optimally utilise their capacities/capabilities as a collective body. The ‘Make in India’ programme of the country could be realised with an exhaustive and effective public-private partnership. SP’s: There is an important segment of the shipbuilding Industry, known as Micro, Small and Medium Enterprises (MSMEs), capable of contributing significantly to the public and private shipyards efforts. How would like to evaluate their role in warship building? DGND-SSG: Equipment indigenisation is a key focus area of the Indian Navy and the rapid developments in Indian industrial scenario is being leveraged by the Indian Navy to develop systems and equipment to replace the foreign origin items with indigenously developed ones. This helps in three ways—reducing the foreign currency outflow, reduced lead time for procurement and also avoids situation of non-availability due to various sanctions imposed view political considerations. Towards this end the Directorate of Indigenisation was setup in 2005, primarily to achieve self-reliance in maintaining and supporting the Navy’s vital assets through the indigenous development route within the ambit of intellectual property rights. The Indian Navy has prepared a 15-year Indigenisation Plan, for the period covering 2008-22, which is hosted on the website of the Confederation of Indian Industry. The ancillary industrial support to shipyards is crucial to timely shipbuilding, as a number of components, material and equipment, varying in size and complexity are required for shipbuilding. Close location, symbiotic relationship between the yard and the ancillary industry as industrial clusters is crucial to cutting cost and time. Therefore, it is important to consider development of defence industrial parks as special economic zones (SEZs). Dedicated areas in SEZ could be earmarked for ancillary industry for main engine, gearboxes, shafting, propellers, generators, switchboards, valves, pumps, etc. With specific reference to ship construction, a large number of subcontractors are involved with the shipyards in executing ship construction activities. Shipyards have also taken initiatives to develop their vendor base and vendor development for supply of components/material/equipment in addition to ship construction activities is an area where significant work is being undertaken by the DPSUs. A workshop was recently organised by the Mazagon Dock Limited, Mumbai, to expand vendor base for warship building and thus provide impetus to ‘Make in India’ movement, wherein shipyards, the Indian Navy and Coast Guard presented their requirement, vendor registration procedures and quality assurance requirements to a number of MSMEs that participated.